This game hit the table during a gathering I attended, and it hit the table time and time again. The concept is easy enough to understand. There is a parade in Wonderland, and it is for us to make the best parade without anyone turning sour…. 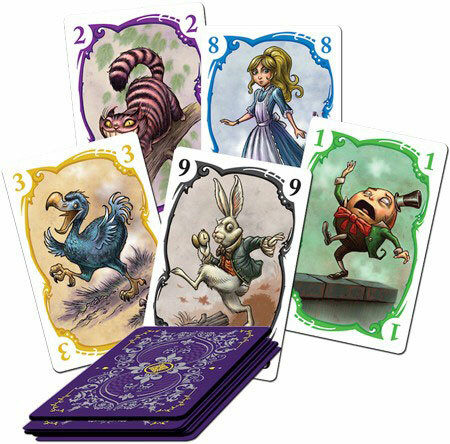 A fast paced, thought provoking card game! The game is played untill either the deck is exhausted, or one player has five colors in front of him/her. Now we count minus points. Then all players, including the one ending the game, gets one more turn. That leaves you with four cards in hand. You keep two, discards the other two. Then at the same time, all players reveal their cards at the piles they already have in front of them. All cards count as minus the number that shows, apart from 0 which goes for 0, of course. However, if you have majority in number of cards in one color, you lay them face down in front of you. Now they count as -1 for each card. There is a kind tie break here. If two or more players have equal amount of cards in one color, they all get to flip their cards. The player that is the closest to 0 wins. Even though this qualifies as a filler game, short, easy to learn, and all that, there is a lot of counting involved. You need to check your cards constantly to see how they fit into the ever changing parade. I found it quite fun that a filler game had a bit of depth to it. 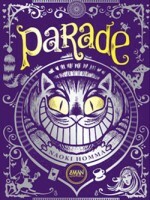 Add a Review for "Parade"